He snarled as he grabbed the instrument away from her. He was immensely strong, and with great force, he slammed into her, pitching her head first into the glass coffee table, the intensity of the force shattering the table in a shower of glass fragments. She felt her head explode with white-hot pain. Time seemed to stall. The pain was intense. The room sagged and swirled around her as fireworks exploded in her head. Get up, get up, her inner mind yelled, as she could feel the warm sticky blood gushing from her head and running down her face. Then everything went black. 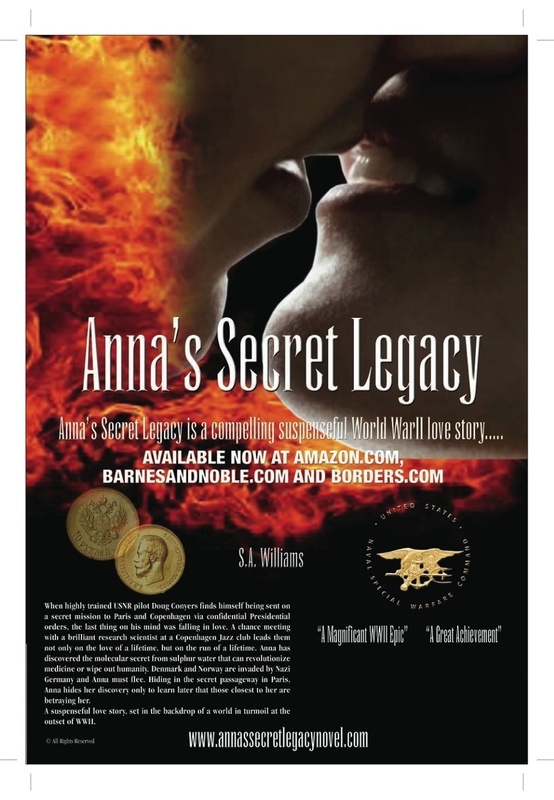 This entry was posted in Anna's Secret Legacy, Anna's Secret Legacy Blog, Annas secret legacy novel, Book Blog, Book Signing, Borders, Love Affair, Pressroom and events, Scientific Discovery, spies, World War II. Bookmark the permalink.